Milan (Agenzia Fides) - Six months ago hurricane Matthew hit Haiti, causing the most serious humanitarian emergency in the Country after the 2010 earthquake. The situation is still difficult today. In a note sent to Fides, CBM, an international humanitarian organization committed in the prevention and cure of blindness and disability in Countries in the South of the world, reports that a million and a half people are at risk of food insecurity, many rural areas are inaccessible because of the damage to roads. 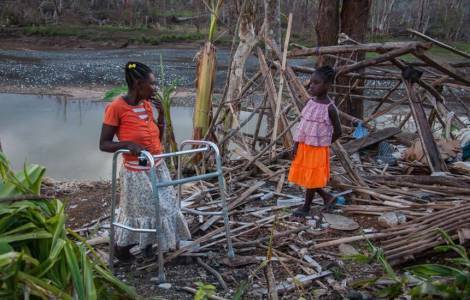 Immediately after the hurricane the Response Unit to Emergencies of CBM activated a program that ensures the victims, in particular to persons with disabilities and their families, to access to aid, receive psychological support and resume livelihood activities. The aid plan provided for a first phase of identification of persons with disabilities, the reconstruction of the destroyed buildings and the distribution of agricultural kits of seeds and small animals, as well as the implementation of activities aimed at the prevention of risk.